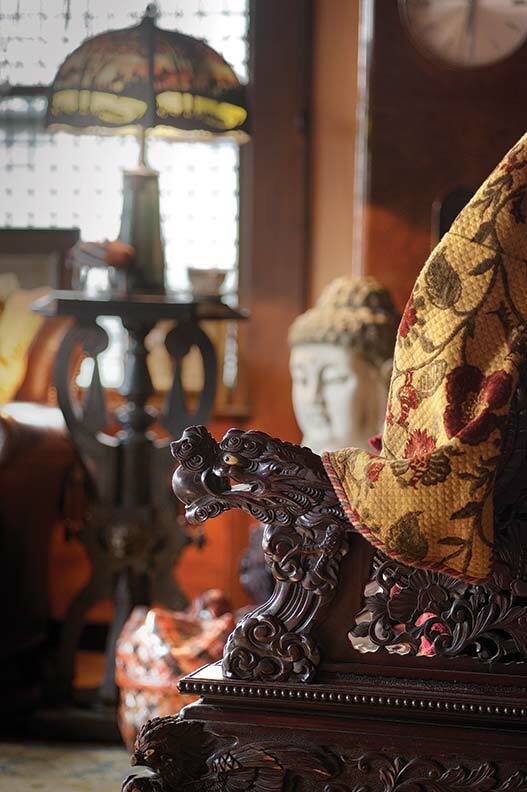 The house is an eye-catching oriental expression with upturned gables and carvings; second-story balconies with curved railings are reminiscent of a Shinto temple. 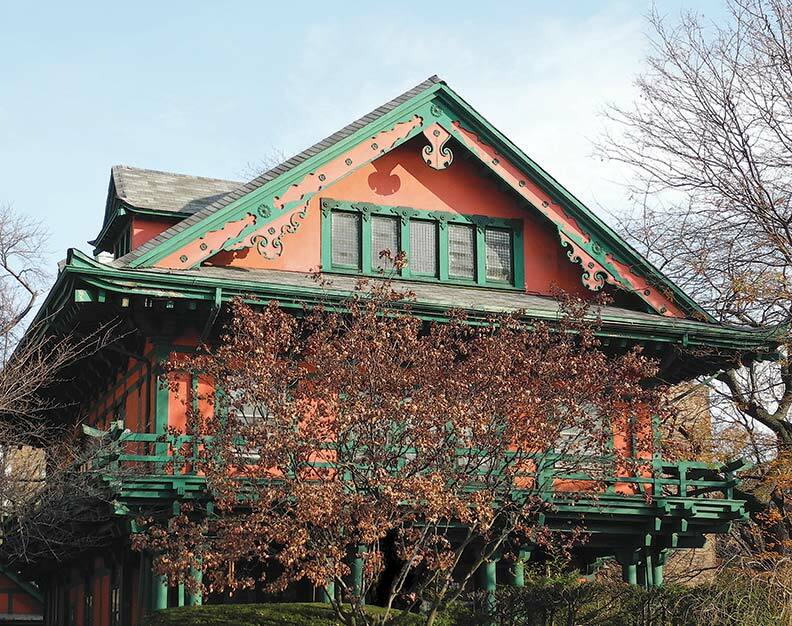 Architects John J. Petit and James C. Green meant for it to be Japanese in spirit. (The house originally was advertised as an “East Indian Bungalow”—bungalow being a relatively new and oft-used term for anything exotic.) The architects brought over three Japanese craftsmen to help in its construction: the contractor, the decorator, and the master gardener. With its curved gables, upturned eaves supported by ornate brackets, and vergeboards ornamented with cutouts and chrysanthemums, the house attracted a lot of attention. That’s just what real-estate developer Dean Alvord wanted. Brooklyn at the turn of the 20th century was in its heyday; it was an easy commute by elevated trains to downtown Manhattan. Alvord had purchased a 50-acre tract in Flatbush in 1899 and dubbed it Prospect Park South. His motto for the development was rus in urbe (“country in the city”), reflecting his vision of a park-like residential community of substantial homes—each more than 3,500 square feet and costing at least $5,000. Tree-lined grass malls gave the illusion of an English park, brick and terra cotta gateposts marked entries, and the streets were given names that evoked British nobility: Albemarle, Buckingham, Marlborough. A Japanese house would garner press. 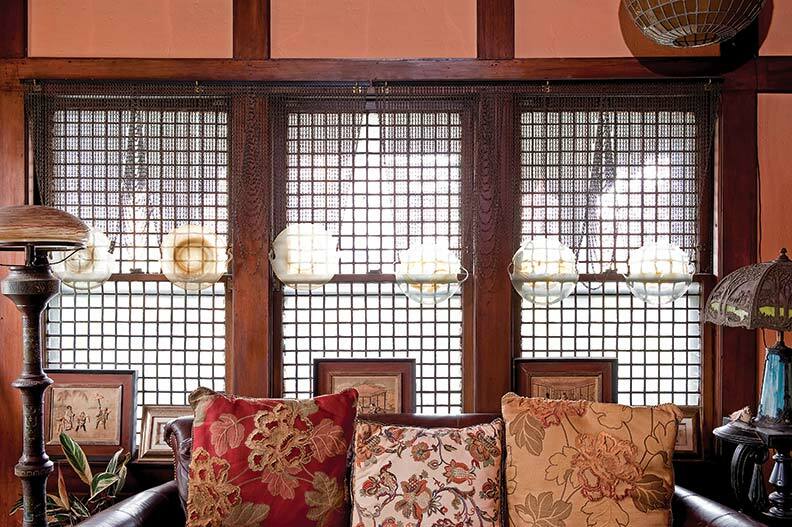 Offered at $26,500, the house was advertised as “a faithful reflection of the dainty Japanese art from which America is learning so much.” The style was, however, a bit much for the average American, and the house took several years to sell. In 1906, Dr. Frederick Strange Kolle, a prominent physician, bought it. Although the home passed to several owners over the next century, it was never altered and remained a neighborhood landmark. 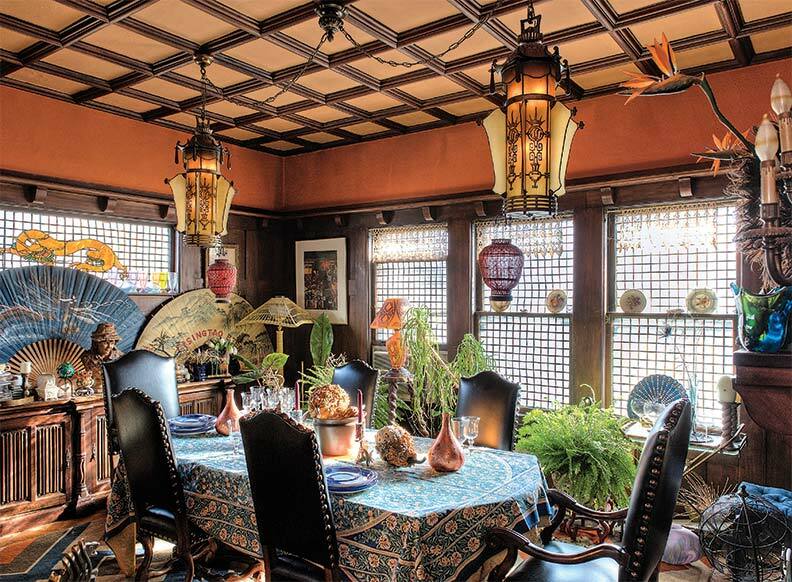 A pair of salvaged Chinoiserie chandeliers lights the dining room, which retains original stained and leaded glass windows and teak woodwork. When Gloria Fischer and her late husband, Albert, came to Brooklyn in 1972, Gloria admits she was at first skeptical about the move. But she fell in love with the verdant boulevards of Prospect Park South, an urban oasis in 1970s Brooklyn. She particularly liked the quirky Japanese House, which had recently come up for sale. 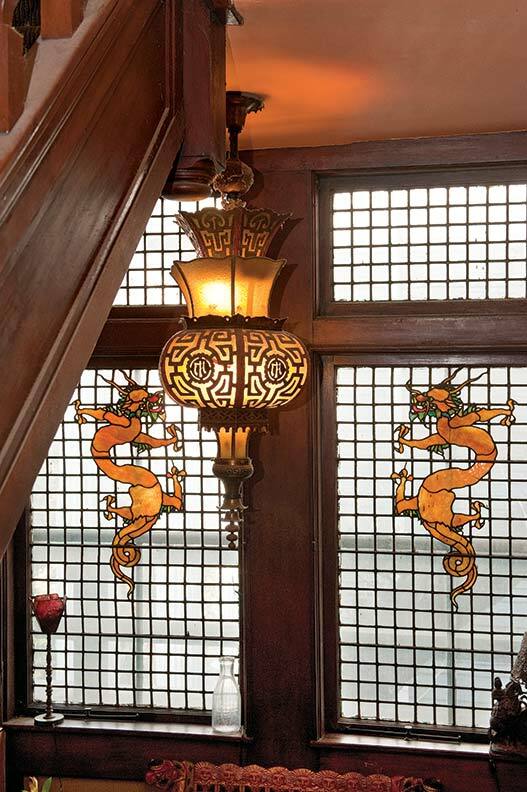 The interior remained as-built: Carved dragons guarded the front door; teak woodwork and boxed-beam ceilings graced the main reception rooms; sunlight poured through expanses of leaded glass. A wide staircase wound upstairs to six large bedrooms. The servants’ quarters and a billiards room on the third floor were perfect for the Fischers’ children. Of course, the house required substantial updating. Electrical, HVAC, water, and sewer were redone. The teak woodwork, never painted, required only a good cleaning and a coat of varnish. 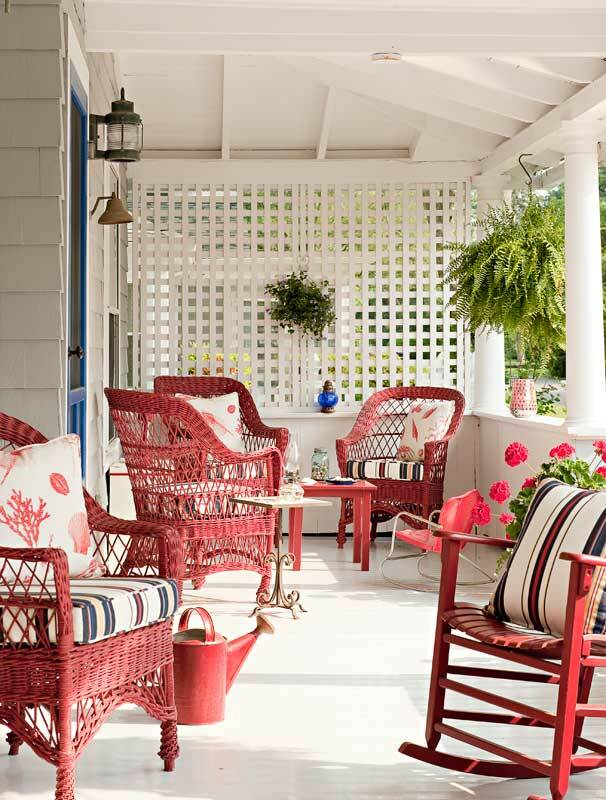 The original burlap wallcoverings were left intact and freshened with a coat of terra cotta red. 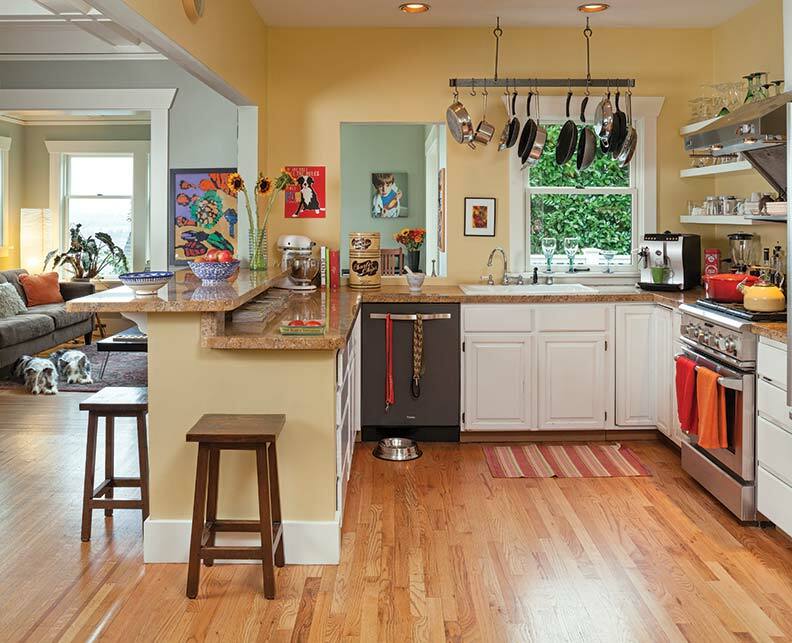 The Fischers made just one structural change, removing a wall dividing the kitchen from a back pantry, which gave them room for an eat-in area. 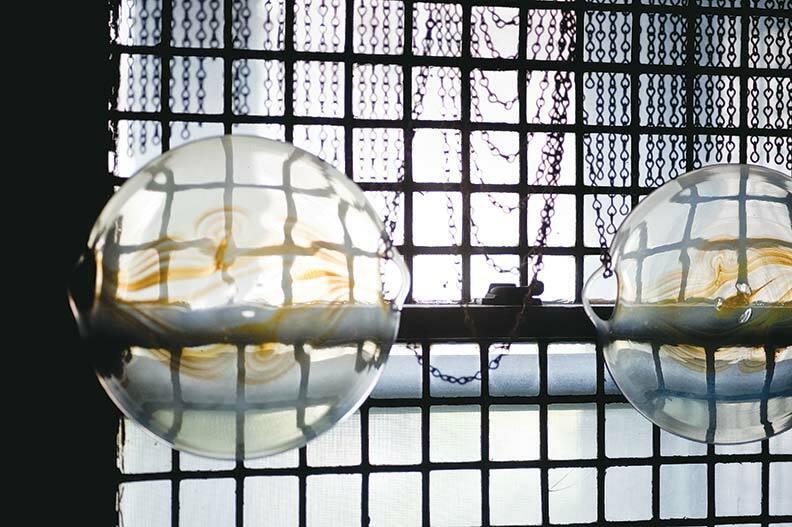 Lamps of the early 20th century flank a sofa piled with pillows; blown-glass globes suspended on chains are used in lieu of curtains, complementing the Far Eastern aesthetic. Gloria found Chinoiserie vintage chandeliers, salvaged from a movie palace that was being razed, and hung them in the dining room and upper stair landing. Lifelong collectors, Gloria and Albert filled the rooms with their favorite acquisitions, including an eclectic assortment of Art Nouveau lamps, oriental textiles, and export furniture dating to the early 20th century. 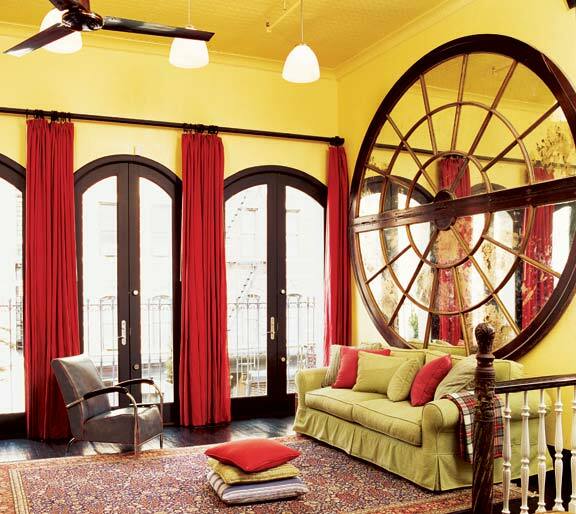 Outside, the house had been painted in a Colonial Revival white and yellow scheme. Paint scrapings revealed the vibrant original palette, which Gloria reproduced: terra cotta orange on the stucco body, with contrasting trim in Mandarin green, and carved accents picked out in deep green and Chinese red. Gloria became actively involved in preserving not only her home but also the neighborhood. She helped in the effort to get Prospect Park South designated as a historic district by the New York City Landmarks Preservation Commission in 1979. Find resources for this story here.